I'd be more than happy to proof read too - particularly for the Russians I also have quite a large collection of photos on my laptop which I could sort through- all Russian, of course! Am sorting through all old photos, pedigrees and results, and will be ready when the time comes. The more people that contribute the better we can make this. Thank you for all the offers so far, do keep them coming. This is a brilliant idea - but it'll be a huge project! Maybe it'd be easier for you to add things as you go in sections?? As there is so much else to add - performance... ridden/jumping/western/ dressage, apart from in hand and pedigrees and anglo and part breds & coloureds + all the show records and all the photo records & gosh... all the history that people have! It would be a wonderful thing to do though. Yes think its going to be huge If everyone just adds a bit of knowlege and helps eachother its going to be brilliant. The more sections the better so all suggestions are more than welcome, we dont want to miss out on anything. Although allbreeds is very usful, there are quite a few errors. I doubt whether pedigrees are checked on that site. I am sure that AL will verify all pedigrees that are submitted. may even end up being published as a book!!!! you never know. i know perhaps not some thing big in this county but can offer info on coloured arabian partbreds if needed?? HI Paula, delighted to proofread if you need, or sort or whatever....and what FANTASTIC QUARTERS our breed used to have....power behind the saddle like it should be!! THEY DONT MAKE THEM LIKE THIS ANYMORE!! GOLDEN WINGS was a Pure Crabbet Arabian gelding, Bred by Mrs E M Thomas in 1966. Wings stood 16 hands, excelled in the hunting field, where he flew the jumps and would go all day, never tiring. His well deserved fame came from the gruelling world of top class Dressage. 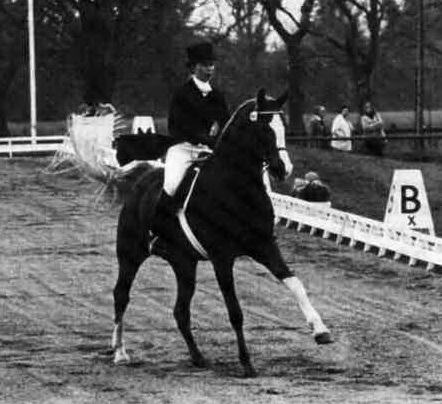 Wings and Carol gained Ridden BNC in the showring at the Nationals and competed successfully at Royal International, a favourite venue for Wings as he loved the applause of the huge crowds there. This incomparable team gave dressage displays at the performance show and Ascot, also riding side saddle. OK, everyone that has offered help we are going to launch a new sub forum for AL LL specific discussions. All members are welcome to post suggestions to this forum for inclusion in the AL Living Library. Very happy to add in my contribution where relevant Especially as this will build into something for the long term! Very excited at the prospect of what could be achieved here. All that knowledge and information being recorded for posterity is a great project. For example, the picture of Golden Wings that Babs posted is lovely, but, with the information she gave us about this amazing horse, makes it so much more interesting. It's the personal things about these horses, character traits, strengths, and weaknesses, that we want to know about. A huge undertaking for sure, but so worthwhile. Thanks to all who will be contributing.